of December. Wish us luck! That is really cool. I stopped by Bass on my way back from a trip to Waveland, Mississippi. I hope you will post a short report about your trip! Here's an update, kinda sad story. The original mission trip was arranged by Maranotha and Mr. Henry Livergood. It was schelduled to go off in December. Mr. Livergood got sick, with of all things, a bad liver. The trip was postponed, then canceled. But our director called the pricipal and arranged for us to go down there as a club by ourselves. So we go in March, I think. Anyways, please continue to pray for us, and pray that Mr. Livergood finds a liver soon. We leave on Sunday! I'm excited! 2 members of staff won't be going because they had a baby. (Same baby, though) But it's still cool. Most of the club is going. Okay, I think Mr. Livergood got a liver transplant from his son.=, too. What a rush! I want to go back! More will follow. Yeah, I already miss the spot that I was at. I want to go back! It was a great week, and a bit overwhelming to put into words, but here it is. After a One hour plane ride to BWI, a one and a half hour flight to Jackson and a one and a half hour drive from Jackson Int'l to BMA, we arrived at the academy at 10:00 CST. Our group spilt up and went to the girl's and boy's dorms. The next day we woke up at 6:00 AM and headed over to the Gymateria. (Their makeshift cafeteria located in the gym, the old one was being rebuilt.) After breakfast we were taken on a tour of the campus. It was of for orientation more than anything. After our tour, we were told we were going to be putting insulation in the new music building. So we rode in the back of the contractor's pickup truck down to a huge storage warehouse to load up with salvaged insulation. I don't like salvaged insulation anymore. Everyone got it all over them. It even got on the camera lens when we were taking photos. Needless to say, anfter lunch only the TLT's continued to work at the music building. The others went to move/clean shelving in the new cafeteria. Eventually near four o'clock we finished, and got to take a shower. We kinda just chilled until dinner. Resting, and picking insulation of our arms. I'll post the rest in another post later partly because I have to go and partly because I'm writting most of this in edit mode because I accidentally posted too soon. Resting, and picking insulation of our arms. don't you hate that insulation...lol Installing that is what i call true selfless service...j/k Thanks for sharing some of you experiences, I love reading about other mission trips!! Amen to that, I LOVE mission trips!! I'm waiting for more information when you get around to it... not just from VP, but Rider1000 also...k? I could spend forever talking about Cuba! Our group, including rider1000, arived in Cuba late February 23. We got to our hotel and crashed (fell into bed). The next morning we got up and started working on sermons and making sure that all our equipment was working. Two or three in our group didn't have their checked baggage for two days. Friday night was the beginning of the evangelistic series for our 8 different speakers. I wasn't nervous until 5 minutes before I got up on stage (I was one of the speakers). The sermons continued for 16 days strait. Preaching got easier and easier as the nights went along. But editing the sermons beforehand was an all day job. We saw lots of 1950's cars while we were down there. There were some 1940's cars as well. It is funny, after the US embargo went into effect, all the cars are Russian. Now you are starting to see some European and Oriental cars in Cuba. Most of the new cars are tourist cars though. The last Sabbath that we were at our evangelism sites, there were baptisms! There were 9 at my church alone! Another 9 were supposted to be baptised either this Sabbath or this month. There were also at least 35 people who were studying the bible and preparing for baptism. The campaign was all over Cuba. Our 8 sites were just a small amount of the campaign. The entire campaign had 208 baptisms, and at least 500 who are going to be studying the bible and preparing for baptism. Everyone of our 8 speakers was in 9th through 12th grade. This is a great example of what the youth of the SDA church can do for God! It was hard to part with our churches. They had been our family for almost three weeks. Every church gave their speaker, mentor, and other evangalistic person at least one parting gift. What a blessing this has been. I hope that you all get a chance to do something like this at some point in your life. It is SO different from any other mission trip. The building mission trips aren't even close to the same. Neither are the medical mission trips. I have been on or seen the results of both of these other kinds of mission trips. I can't speak for long term missionary work, but that must be the closest thing to it. If you want to know more, feel free to ask rider1000 of I about it. You can either email me about it at bjgadd@gmail.com or contact me here on this thread or even private message. That's really awesome VP!!! I wish I had the gift of preaching. But my gift is more in music and with children. I really enjoy hearing of all the mission trip miracles and everything. Pray for my aunt. She heads up a mission trip for her students every other year. This year they went to Peru...Pichanaki (sp?). She had a very rough time getting there...she was dehydrated and sleep deprived and she had a cold when she left last Wednesday. Her sinuses didn't take the pressure changes very well, and by the time they were descending the last time, she was sobbing because the pain was so bad. And then her ear drum ruptured! My cousin, 8th grade, was freaking out. Because not only was she crying, had her eardrum rupture and start leaking, but she got this bloody nose that wouldn't stop bleeding. So it's been a rough start for them down there. So just pray for them a lot!!!! TMA!!!! I'm so excited!!! I leave tomorrow!!! I'm so excited to get together with other teens and make a difference in Brewster! It's gonna be so awesome!!! I'm definately working with the kids again this year. And here inlies another prayer request. I don't know how many are gonna see this before tomorrow...maybe not any. But pray for one of our teen girls. Her mother is deciding at the last moment that maybe she can't go. I feel that this would be really good for her. A way for her to do God's work, ya know. So hopefully her mother lets her come...see how much she can make a difference in a week. Thanks so much!!! We will be praying for both trips. All the best. Yeha, I'm back with more to share. But before I begin I would like to say: "Old insulation is worse than new insulation." Anyways, on Tuesday we got to really get dirty! (Kinda) We were busting down some cinder block walls in the old elementary school's showers/bathrooms BMA was repurposing. That, for me, was the best job ever! It doesn't get more manly than taking a mighty swing at a cement wall wiht a huge mallet and watching it bust into pieces! Although after lunch, it was just the older kids for a while while the younger ones cleaned shelving for the cafeteria. On Wedensday, we put up and took down tents flooded with 100% authentic Katrina Water... and 100% authentic Katrina mold. Putting up and taking down all of those tents took a while. Two days to be exact. Thursday night we went to pathfinders, and had a great time with the soapcraft honor. We also taught the other club some of our special marching moves. On Friday we moved all of the food/ cooking equipment from the Gym to the new Cafeteria. That took all day, and after that was done, we unloaded a semi that contained steel for the roof of the walkway. Saturday was a true day of rest, and after church we went down near the coast. The destruction was amazing. Some places the only thing left was a foundation and front steps. Words cannot begin to describe it. Even six months later. Sunday we traveled home, and were reunited with our families at the airport. It was a great week, and if I took time to note all the details, this forum would run out of web hosting space. But before I begin I would like to say: "Old insulation is worse than new insulation." It was a great week, and if I took time to note all the details, this forum would run out of web hosting space. I guess I'll start with Raw statistics: This was Upper Columbia Conference's (UCC) 10th anual TMA. It was during UCC's spring break, 97 teens went a total of 120 pathfinders and staff. Unfortunately about 10 became sick during the trip! We converged on Brewster, WA and really made a dent for God there. But what was most awesome was the Spiritual "building" we did for the church and community. Wayne Hicks (conference pathfinder director) organized the community service. All of Brewster new we were there by the end of the week I'm sure. Although, Brewster isn't that big of a town. It's kinda a "secret" but one main reason Mr Meharry (the TMA leader) does these events isn't just for the community and church, but for the teens that go. We had really spiritual worships morning and evening. Our work groups were also our prayer groups. If you ever come to TMA you will notice that the kids really sing good!!! I was privileged to be in charge of the music again this year. It was very awesome leading so many teens in praise to God. My brother wrote the theme song this year. It was on service and was a really awesome part of the week. Last edited by Mitch on Wed Apr 26, 2006 7:14 am, edited 2 times in total. I'll try and help out some... Mitch got most of the basic stuff for you guys, but I can tell some stories of what happened out there. On monday, our first workday, our mission team (we were split up in 12 teams) went to an old lady's house who was getting ready to move. She had a pretty big yard, but it was literally covered with 6 inches of leaves. We spent all afternoon there and filled like 50 bags with leaves. Another day(can't remember which) one team went the local nursing home just to talk to the old people there and one of the old ladies there had a stroke right in the middle of the talking session. One of the ladies was downright terrified and one of the pathfinder girls talked to her and asked if she could pray with her. Another great thing that happened was that on Thursday and Friday we put on a free community carwash. We washed like 50 cars those two afternoons, and everyone of them either got out of the car to talk with the pathfinder leaders or sat in the car reading the Steps to Christ that we gave out. On Sabbath, we had the service with the Brewster Spanish Church at the sanctuary we had helped build. A couple got married that Sabbath, and then in the evening 13 members were baptized (including the recently married couple). I think the most touching part of the whole trip was when a little girl was baptized (she couldn't have been more than 8 years old). After her baptism, they wrapped her in a towel and handed her a microphone. There she stood, shivering and wet, and she sang. She sang from the joy in her heart that she had been saved. They descended on Brewster--almost a hundred ready-to-serve Pathfinders and a couple dozen adults eager to leave a trail of kindness and plant footsteps of progress during a weeklong Teen Mission Adventure. The 13-16 year-old youths, representing 20 clubs from Upper Columbia Conference, paid $95 each to spend their spring vacation "Making a Difference." Passing commentators affirmed that..."great bunch of kids!" "Nothing like this has happened to Brewster before!" The big thrust centered about the sprawling former grocery store on Main Street into which the Hispanic Seventh-day Adventist congregation had moved in June. Slated to become a worship center for the growing congregation, the challenge of remodeling loomed like a giant. Fast backward glance. Steve Meharry, director of Waillatpu Pathfinders in College Place, dreamed with other youth-oriented leaders of working together on special once-a-year projects to share God's love in service. 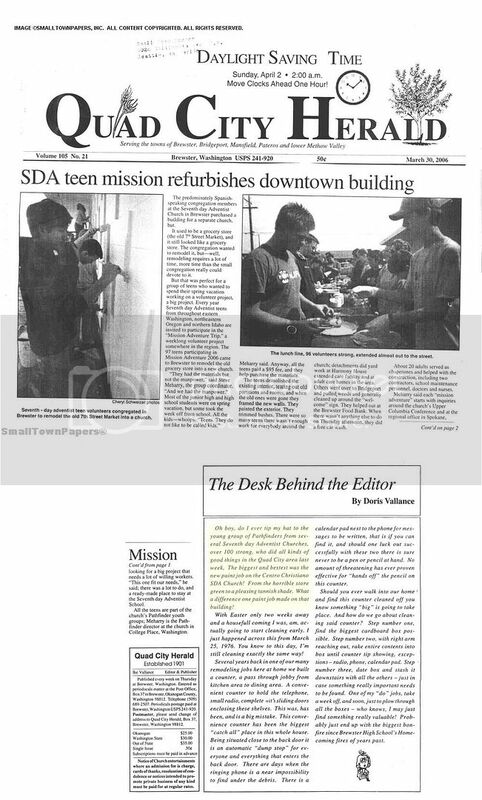 The TEEN MISSION ADVENTURE became reality in l997, and Steve, project director, is one of three leaders who have been a part of the 10 adventures to date. As they checked out 2006 needs and prayed for direction, Brewster's remodeling cried out for help--financial and manpower struggles in preparation for electrical phase soon to follow. James Montgomery and John Steward, licensed building contractors from Cle Elum, knocked off work for a week to supervise demolishing old walls, moving fixtures, framing, building. Paint crews covered the exterior's gaudy green with a handsome beige then, with experienced brushes and leftover energy , moved to the Adventist school gym to brighten the lower interior. Focusing on community service, UCC Youth Ministries director Wayne and Jeri Hicks discovered myriads of opportunities for the teens. They installed a new welcome sign at the entrance to nearby Bridgeport and did cleanup at the town's middle school; assisted at Adventist Community Services (ACS) and helped serve 110 families at Brewster's community food bank where they also spruced up the yard around the host Episcopalian church. Sixteen Pathfinders and three adults painted the interior of a nine-room dwelling in three hours as some of the fluent teens chatted between strokes with the curious, wide-eyed Hispanic kids. They shared music, prayers, lovepats and encouragement and ran out of Nathan Greene postal paintings as they visited nursing homes for reminiscing sessions. They cleaned yards for several elderly or disabled folks; offered a free car wash then handed Steps to Christ to drivers sporting shiny vehicles. A small contingent joined the local Kiwanis Club at a noon meeting at the invitation of a member..."Come explain what in the world you all are doing here in our town!" As a team adult stopped for supplies at a business across from the church (where the owner lent an extra hose nozzle and refused payment for a big jug of cleaner) she learned shifts of visitors came by and parked on the bar stools to observe kids at work and comment in glowing terms. The Adventist school, four miles from town work center, turned into a lively "home base" where chief chef Elizabeth Yeater (her six children, including two on the teen team) and helpers whipped up hearty, tasty meals--noon lunch was transported to the church parking area. The school assembly room turned into a girls' dorm and the fellows stretched out sleeping bags in the gym where all met for daily worship--mornings with Brewster's recent pastor Gordon Smith and most evenings with Hispanic pastor Kessle Hodgson. Praise teams led singalongs includingthe themeTo Be Free, written days before by teen violinist Zachary Swena. "We have a message to share that the world needs to hear Of a Jesus whose love is so dear..." Small groups met with leaders for prayer after evening worship talks and activity reports. The Prayer Wall reflected petitions and praise. Sabbath was a day of joy and triumph. With the fragrance of new lumber wafting from neat stacks moved to accommodate chairs for an appreciative congregation, dozens gathered with the Adventure crew for services. A day of celebration, not only for the Sabbath, but for a new family focus--a wedding, baptisms--people and church alike, truly "a work in progress!" Among the dedicated l9 adults and three college students who mentored the dozen teen teams was Michael Jeffery, now in charge of Camp MiVoden guest services. "As a teenager at 16," he recalled, "I attended the very first TMA..and was glad to find it was a fun and spiritual week. Ten years later I continue to come as a staff member because I feel that allowing the teens the opportunity to reach out to our community is worth taking the time off work. I..look forward to this week each and every year!" Former "tough biker" Walt Taufen of Lewiston "What really makes this fun is watching the light come on in the kids' eyes when they see lives being changed by what they do in the Pathfinder ministry." "TMA is awesome!" related Courtney Balmes, Yakima. "You get to meet new people, have fun and share God's love...I can't believe it's almost over. So I'm looking forward to next year because of how many ways you can show God to the world." From Zach Huff, Clarkston: "TMA has been a great experience for me as well as other fellows Pathfinders..meet new friends, serve the people and God...certainly and undoubtedly changed many, including me." "Frosty" Cross, Columbia Basin District Pathfinder coordinator and wife June, bundle of energy, "Jill of all trades (photography by June) were among enthusiastic leaders. He's helped with all 10 missions; she, seven. Mixed emotions swept over the group as they wrapped up the Adventure Sunday morning--and left, not only footprints, but a bit of their hearts with the Brewster community. And, the words of another of God's servants echo a clarion call "With such an army of workers as our youth, rightly trained might furnish, how soon the message of a crucified, risen, and soon-coming Saviour might be carried to the whole world!" Education, p. 271. Well it was an incredible trip. We learned a lot of amazing things. The people were so friendly and communism really doesn't work. Our faith was strengthened. He protected us the whole trip, and only a few people got sick. Our prayer lives were strengthened as we asked the Holy Spirit to guide us in our actions and words. I would definitely recommend a mission trip to anyone who asks. By the way, The trip was legal, approved by both the US and Cuban Governments. It makes a big difference about your trip as to whether you go legally or not. They are going to Cuba again this coming spring break. Anyone interested? I'm gonna try to go again in 2008, VP, You up for it? I'd love to get a pathfinder group together to go on a mission trip sometime... that would be a lot of fun. I would love to go, but there is almost no way that I can afford it. I have to pay for going to college abroad next summer and possibly next school year. Exactly, Mission trips are worth every penny of the expense. Winning souls for the Kingdom is Priceless!! It can take a while to raise money though. Remember we have just as much of a "mission field" right here in our back yard. Keep Witnessing for Jesus! You are right my friend. You can even witness to friends... oh and you know... Pathfinders is a ministry. As the older kids, it's our duty to minister and set an example for the youngsters. Good luck with all your outreach, and inreach.